signed and dated 1961 and on verso titled and inscribed "#614" / "R-272"
The youngest member of Toronto's Painters Eleven group, William Ronald dived into the passion and turbulence of the New York scene when he moved there in 1954. He met established Abstract Expressionist painters such as Franz Kline and made connections with important figures in the art world. In an ARTnews review of a Painters Eleven exhibition at the Riverside Museum in 1956, Lawrence Campbell called Ronald "the most sensational of the group." This work's title of The Baron seems an apt choice, as it exemplifies the strength and solidity of the artist’s abstract images from the early 1960s. A fine example of Ronald’s concentration on an emphatic central focus, this painting, with its rich reds, striking blue and darker contrasting hues, displays a more subtle play of textures and forms than do his more expressionist canvases of the mid-1950s. 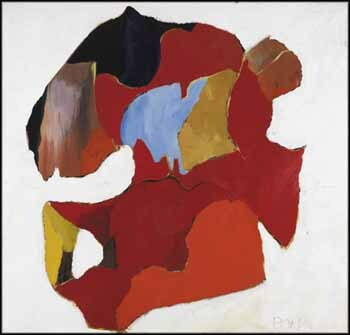 The Baron is reminiscent of two works in the 1972 National Gallery of Canada exhibition Toronto Painting: 1953 - 1965: Gypsy (1959), the catalogue's cover piece, and Jungle (1961), in the collection of the Montreal Museum of Fine Arts.